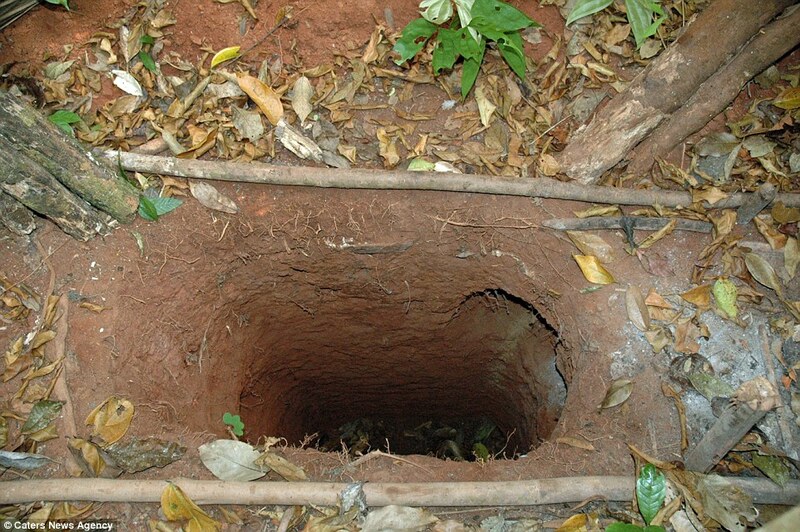 The man, known as 'The Man in the Hole', has been surviving on his own in the remote state of Rondonia, Brazil, since the rest of his people were murdered by land-grabbing cattle ranchers two decades ago. The tribesman spends most of his time hunting forest pigs, birds and monkeys with a bow and arrow, and lives in a hut surrounded by papaya and corn plantations. 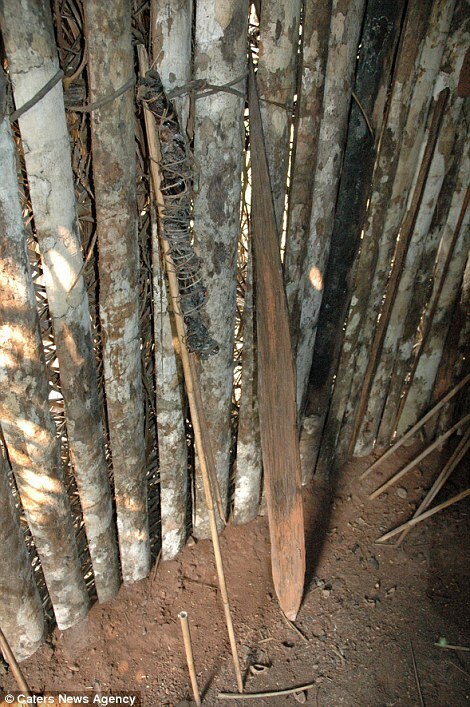 Photos from his home shows a wooden spear and bamboo sticks thought to be used for hunting, and another taken nearby shows one of the holes which has given him his nickname. According to local officials he digs the holes to trap animals, or to hide in himself while out hunting in the Amazon jungle. 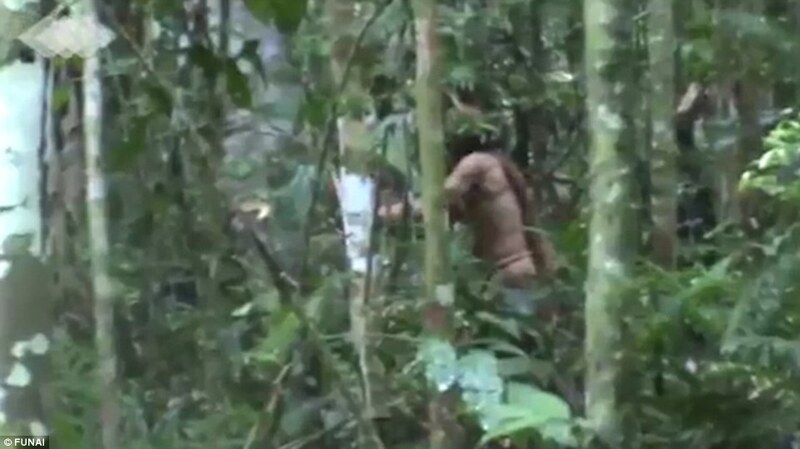 Earlier this month, footage shot by Brazilian government officials was released, showing the man, who is in his fifties, using a hand-made axe to chop down a tree near his hut. There are believed to be 113 un-contacted tribes living in the Amazon, 27 of which have been sighted by experts who attempt to track their movements. Experts from the Brazilian agency for native tribes, called FUNAI, believe the man belonged to a tribe of six - five of whom were murdered by farmers in the 1990s. Survivors of other indigenous groups in Rondonia state have told how invading farmers shot them in the back while taking their land during the period. And Funai has publicly blamed cattle ranchers for the deaths of family of 'the man in the hole'. It is thought that he managed to survive when farmers and land grabbers killed and expelled indigenous Amazonians throughout the 1970s and 1980s. Funai said in a newspost: 'In the 1980s, disorderly colonisation, the establishment of farms and illegal logging in [the Rondonia region] led to repeated attacks on the isolated indigenous peoples who had lived there until then, in a constant process of expulsion from their lands and death. Funai has a strict policy of leaving isolated groups in the region alone, but they have monitored his activity from a distance since he was first spotted in 1996. They do not know his name or the name of his tribe, but have worked to extend the area of his jungle home to 8,070 hectares so he can maintain his lifestyle. An indigenous reserve known as Tanara was set up in the 1990s as part of moves to protect his territory. Traditional weapons like axes and machetes have been left by Funai workers for him to find, but they never allow themselves to be seen by him. WHO IS THE INDIGENOUS MAN IN THE HOLE AND WHAT TRIBE WAS HE PART OF? The 'indigenous man in the hole' or 'the last man' was first seen living a solitary life in the Amazon jungle of Rondonia in 1996. Experts believe he was left on his own when the other five members of his tribe were killed by farmers in an attack on the land the year before. Funai, Brazil's governmental agency for indigenous affairs, has strict rules that limit interaction with isolated and uncontacted tribesmen, so they do not know what his real name is or that of his original group. Members of the research and conservation group have been monitoring his behaviour since 1996, but he has only been seen on film once before now - in a Brazilian documentary called Corumbiara shot in 1998. They regularly check to see if he is still alive and often find him building holes in the earth, which is how he got his nickname, to trap animals or hide in himself. He spends time felling trees, hunting animals to eat and walks around half-naked covered only by a loin cloth. The last man, aged in his 50s, has his own mini plantation where he grows papaya and corn. The area where the man lives is around 8,070 hectares, but surrounded by ranches on all sides. It is 'extraordinary' he has been able to keep himself cut off from mainstream society for so long, given land grabbers and farmers are keen on his jungle land, according to research non-profit group Survival International. They have helped expand his land and lay down handmade weapons for him to use. Funai believe there are 113 uncontacted tribes living in the Brazilian Amazon, 27 of which have been sighted. There are also said to be 15 uncontacted tribes in neighbouring Peru and others deep in the forests of Bolivia, Colombia and Ecuador. Experts regularly check to see if he is still alive and often find him building holes in the earth, which is how he got his nickname, to trap animals or hide in himself. Fiona Watson, of research group Survival International, told The Guardian the video clip of the man is 'extraordinary' given his land is surrounded by ranches on all sides. WHAT IS FUNAI AND HOW DOES IT PROTECT TRIBES? FUNAI, the National Indian Foundation, is the Brazilian government body that establishes and carries out policies relating to indigenous peoples. They are responsible for mapping out and protecting lands traditionally inhabited and used by these communities. The group is charged with preventing invasions of indigenous territories by outsiders. 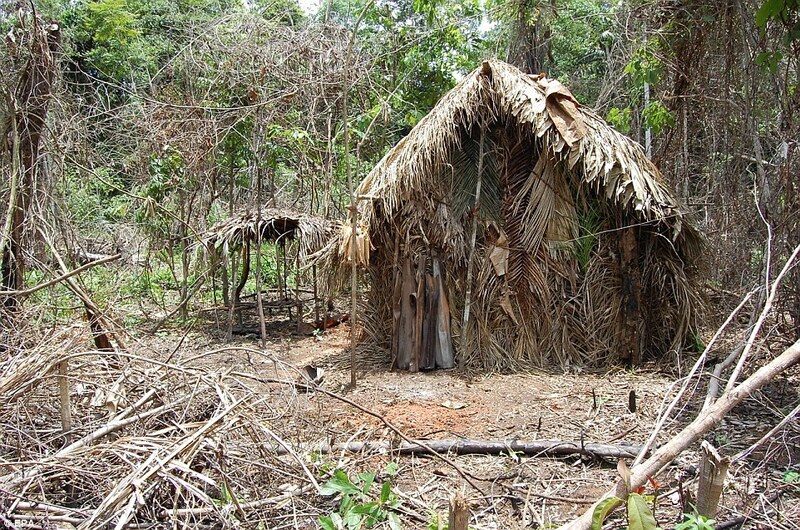 All over Brazil, indigenous peoples are living in differing degrees of isolation. Illegal miners, ranchers, loggers and other groups pose a risk to Indians' lives and well-being and destroy their natural resources. Its work is wide-ranging and includes opposition to 'Hakani', the controversial evangelical missionary film which promotes intervention by the authorities in tribal communities. Funai, who works to protect the rights of indigenous people and isolated groups, claims there are 113 uncontacted tribes in the Brazilian Amazon, 27 of which they have confirmed sightings of. Survival International says there may be as many as 300 uncontacted Indians living in the Massacó territory in Rondonia. 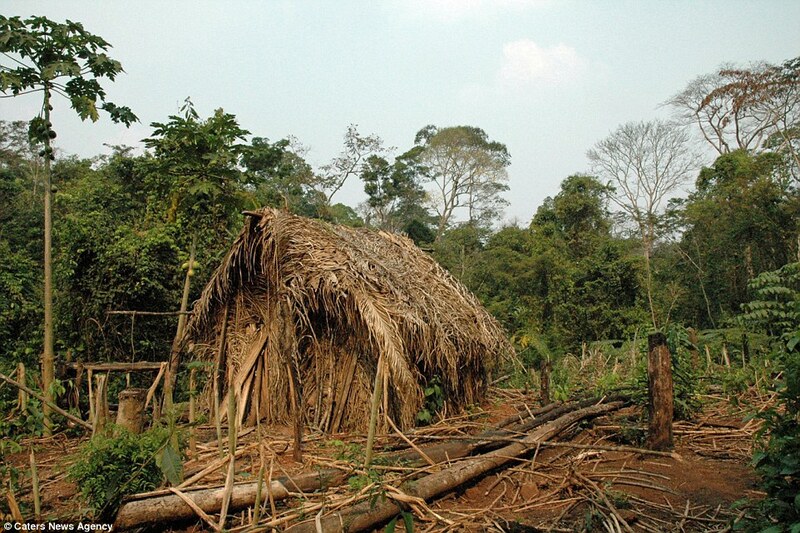 It is thought many tribes have chosen to avoid contact based on previous encounters which have resulted in the destruction of their forest homes. Experts say tribes have been known to fire arrows at outsiders or aircraft or simply retreat deeper in to the rainforest. 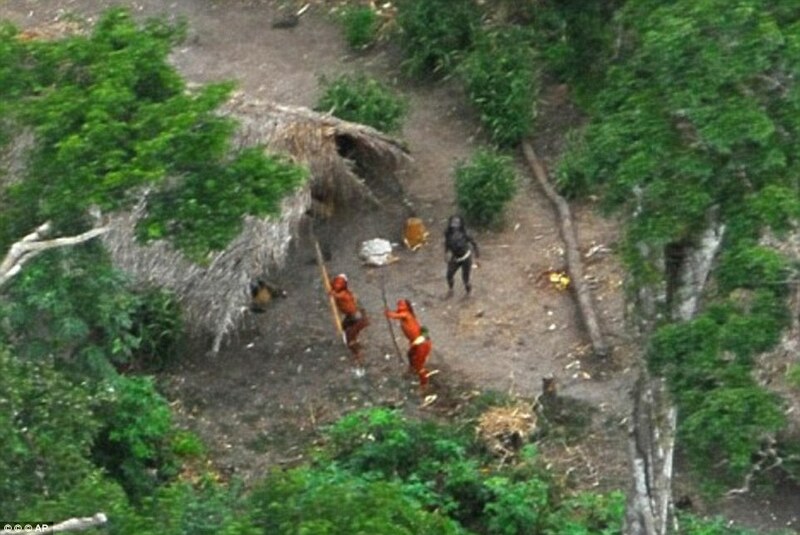 However, other uncontacted groups are facing extinction with no more than a handful of individuals left, the group says. They are coming under increasing threat from infrastructure and road building projects and are increasingly abandoning their territory to avoid the noise and air pollution that comes with it. Having avoided contact with the outside world, tribes are vulnerable to diseases like flu or even the common cold. 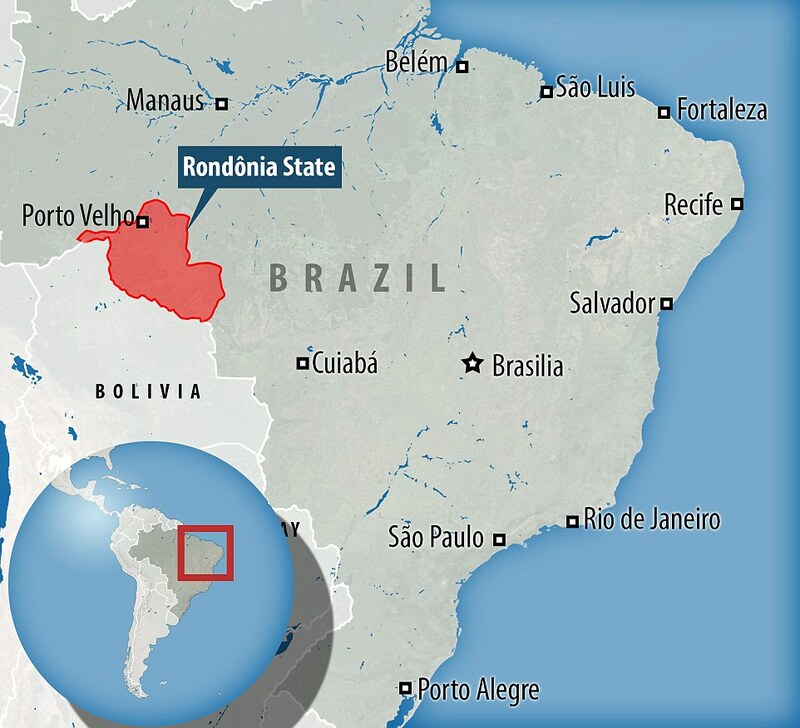 Tiny clusters living mainly in Rondonia, Mato Grosso and Maranhão states 'are the survivors of brutal land grabs when they were targeted and murdered by loggers, ranchers, and others', according to the organisation, which works to protect tribal peoples' rights. The Amazon rain forest spans 2,100,000 square miles with huge areas still thought to remain unexplored. 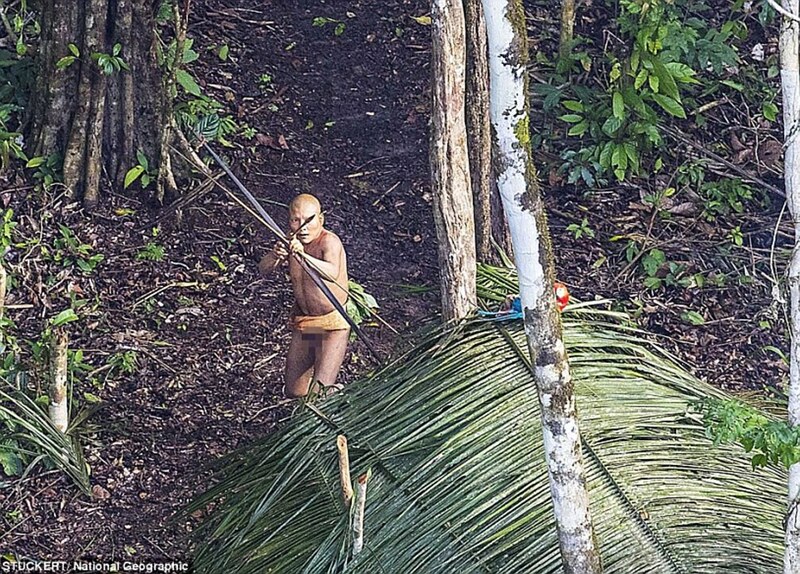 In 2016, extraordinary photographs taken from a helicopter flying over the Amazonian jungle showed members of one of the world's last uncontacted tribespeople. When the helicopter first appeared low overhead, they were panic-stricken — fleeing from their thatched shelters in a clearing to hide under the foliage. Then the men took courage and fired volleys of primitive arrows at the noisy interloper. The Indians exist in isolated nomadic groups in the depths of the Brazilian rainforest near the Peruvian border. 'To think that in the 21st century, there are still people who have no contact with civilisation, living like their ancestors did 20,000 years ago — it's a powerful emotion,' Photographer Ricardo Stuckert told National Geographic magazine. In 2008, an incredible set of pictures emerged of tribesmen hurling spears and firing bow and arrows at an aircraft buzzing overhead. Their skin was painted bright red, heads partially shaved, arrows drawn back in the longbows and aimed square at the plane.